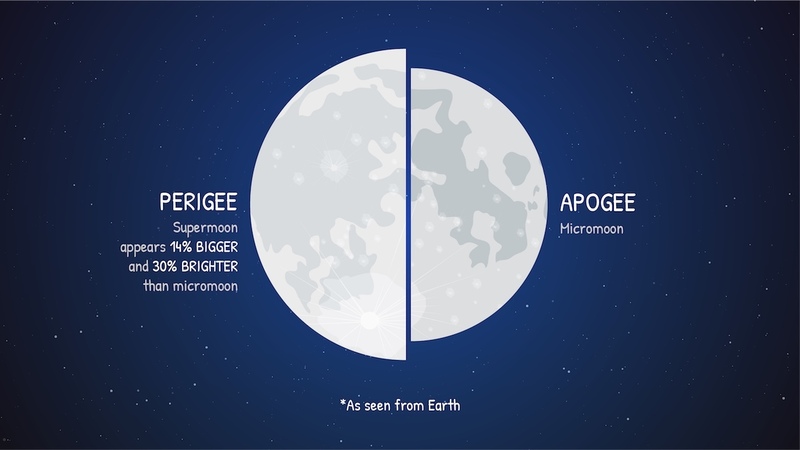 The Moon at Perigee looks a lot bigger than the Moon at Apogee–because the orbit of the Moon around Earth is not perfectly round. Occasionally the Moon swings closer to us and we see it in what appears to be a gigantic form. Imagine you were 30% bigger or imagine a man normally six feet tall, looming upon you eight feet tall. On Friday, two days from now, the Moon will be in Perigee; or, it will be, according to the new vernacular, a Supermoon. It would look the same the 30% bigger, just like the full moon, IF we could see it. But the Moon will be “new”– and entirely dark. And it will not rise at night. It will rise with the Sun about six in the morning and set at nine in the evening. The New Moon has probably always been a symbol death and then rebirth, as the Crescent Moon gradually increases night after night. 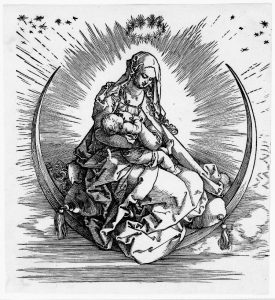 Paintings and illustrations abound of the beautiful and very feminine Virgin Mary with the Crescent Moon. 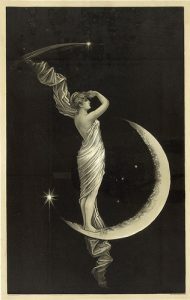 And long before Christianity swept through the world, the ancient Greeks, Romans and Chinese; and, probably a dozen other cultures described the Moon as a ‘feminine” force. Not feminine, meaning gender, but feminine, meaning having intuition, empathy and patience. Artemis, the Greek goddess of the hunt is often paired with the crescent moon, as is the Roman goddess of the hunt, Diana. I am sure intuition, empathy and patience help one to hunt successfully, but it is interesting that such a masculine modern pastime was viewed so differently in the ancient world. 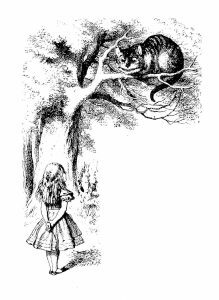 I have always loved the Cheshire Cat appearing first as a crescent moon and then materializing into the only creature in Alice in Wonderland who really listens to Alice. Although edgy and sarcastic, he becomes a kind of care taker, acting as her guide and advisor. And moon gardeners, another kind of care taker, advise us to plant above-ground crops, put down sod and graft trees during the new moon and the first quarter that follows it. Whether the Moon is considered in a deeply religious context or simply an object of intellectual or practical value, it is always a positive. I have said before and repeat, that I love looking at the Moon that has appeared in almost exactly its present form to ancient and prehistoric humans. It links us to this past chain of humanity. 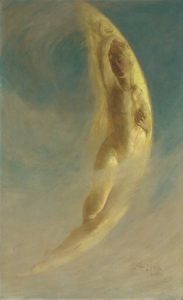 The New Moon has long been considered a symbol of a clean slate and an invitation to correct mistakes. On Saturday night, July 14, the first phase of the giant Waxing Crescent can be seen in the western sky just after the sun sets. If you are lucky, you’ll be able to see the sky smile down upon us.